We have published a tool that will enable you to easily create performance data for your workstations and laptops. I have always recommended our customers to run their jobs with at least two cores, to back up that statement it has been easier to provide a tool that measures performance increase over a number of cores on the customers’ configuration based on benchmark jobs provided by SIMULIA instead of providing empty promises. We are engineers that favors hard facts after all, aren’t we? 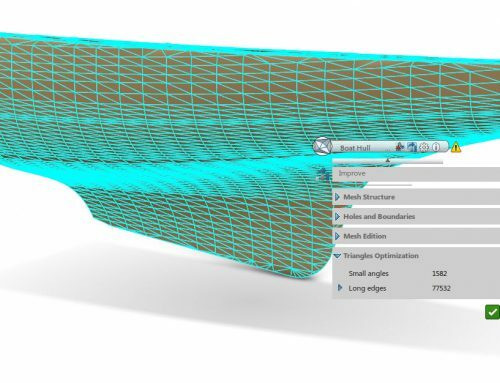 One of the most valuable resource to the FEA engineer is his or hers access to powerful computers. 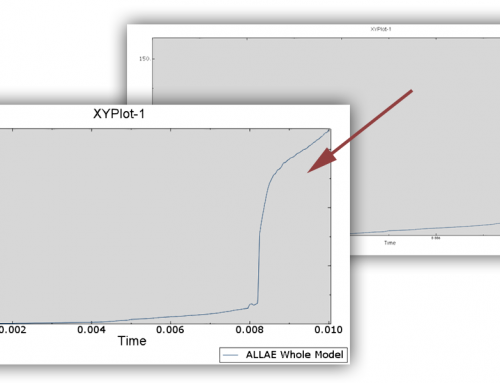 The need for computational speed comes with the FEA territory. Most FEA engineers experience solver time as a bottleneck on a day-to-day basis. The faster our computers manage to crunch the massive sets of differential equations the faster we can refine, improve, explore and gain confidence in our results. Whenever performance is of importance it makes sense to put our scrutinizing engineering brains on the task. What really matters in the world of FEA is wallclock time – the time spent from you submitted the job until it completes. The wallclock time from the exact same job can be used to fairly compare different computers systems. 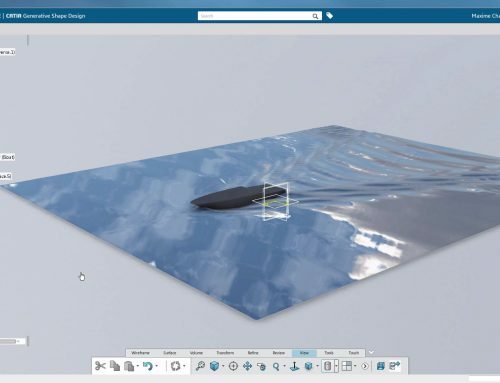 SIMULIA has included twelve different benchmark jobs  within the Abaqus installation to measure performance for Abaqus/Standard and Abaqus/Explicit. They have even published wallclock times for different on-the-market systems . 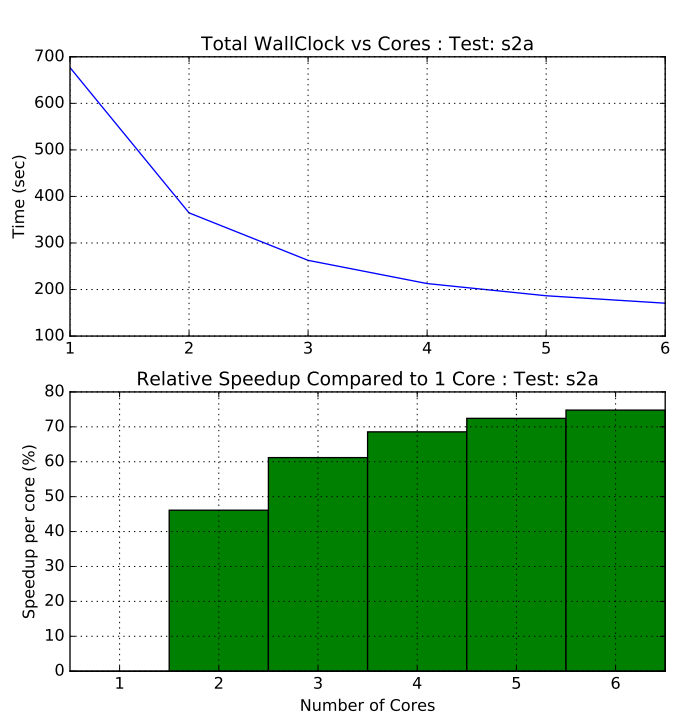 We have all seen the charts that explain that more cores equals less solver time. This is usually true and this curve (wallclock time / number of cores ) tells something about the true computational capacity of the hardware in terms of scalability. Being aware of such increases might make it easier to justify to your colleauges to why you need to use all the tokens available for your immensly huge job. A 7% reduction in wallclock might result in hours saved, or minutes for a very small one. For some non-HPC workstations and laptops, the internal memory bus speed might become a bottleneck that causes the increased number of cores to provide less oomphf than expected. FEA isn’t cheap. Engineering hours, software costs and harware all costs ten of thousands euros each year. Collecting benchmark data will enable you to maximize the ever so famous Return of Investment (ROI) by easy-to-use graphs that clearly showing the gains (reduced wallclock time) by having proper hardware and enough analysis tokens as your disposal, thus increasing the FEA capacity based on knowledge and needs. We have always advised our customers to use a minimum of two cores, as we see that you will almost always get a 30-50% increase in speed (70-50% of the wallclock time compared to one core). Please use this tool to examine if this statement holds up on your system. 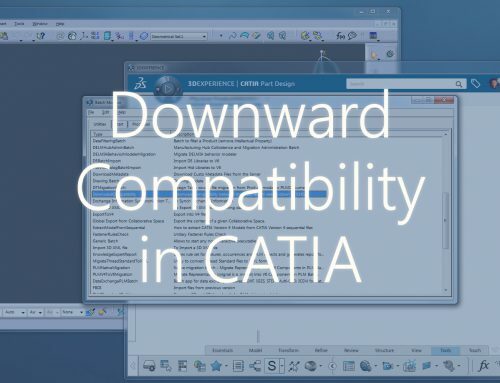 The tool fetches the mentioned benchmark jobs which is available within your Abaqus installation. 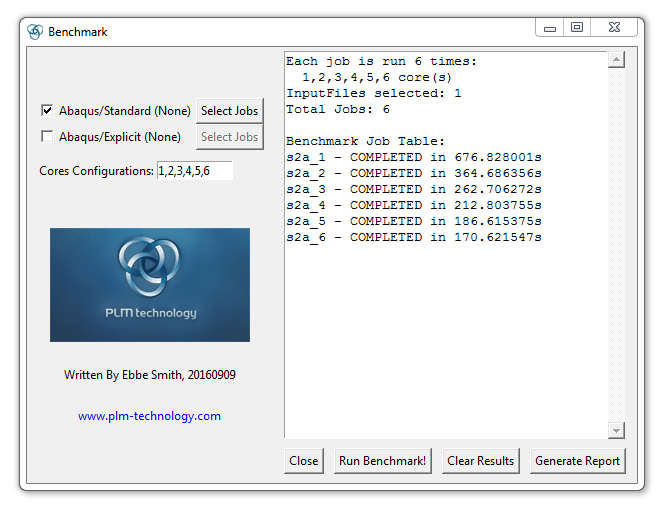 Select the jobs you want to use for your benchmark, select how many cores you would like to test – and the script will run each benchmark test on for example “1,2, 4, 8” cores and compare the run times between the jobs. Both during and and after the analysis you will be able to generate a report (.pdf) which will summarize the relative performance according to number of cores used for all the completed tests. The tool is written so that you can easily run jobs when ever you have the time and available tokens. 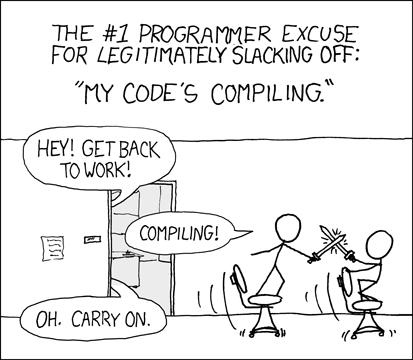 It is possible to stop it at anytime, get back the tokens, and resume it a few days later to do more tests. For each completed test, the report grows in size. 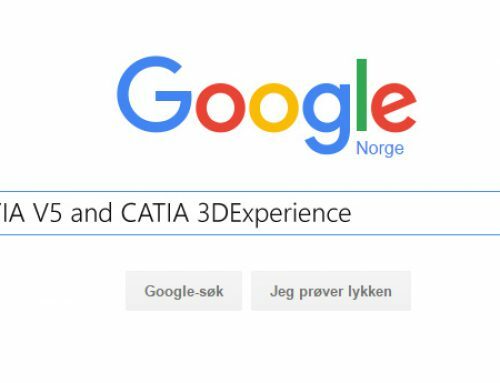 Fill out the form below and we’ll send you the executable!